Police in riot gear, armed with a video camera, march towards hooligans who climbed over the fence and entered the pitch shorty before the end of a German 3rd soccer league relegation match Kickers Offenbach vs 1. FC Magdeburg, May 31. Offenbach, Frankfurt’s eastern neighbor city, lost 1-3. 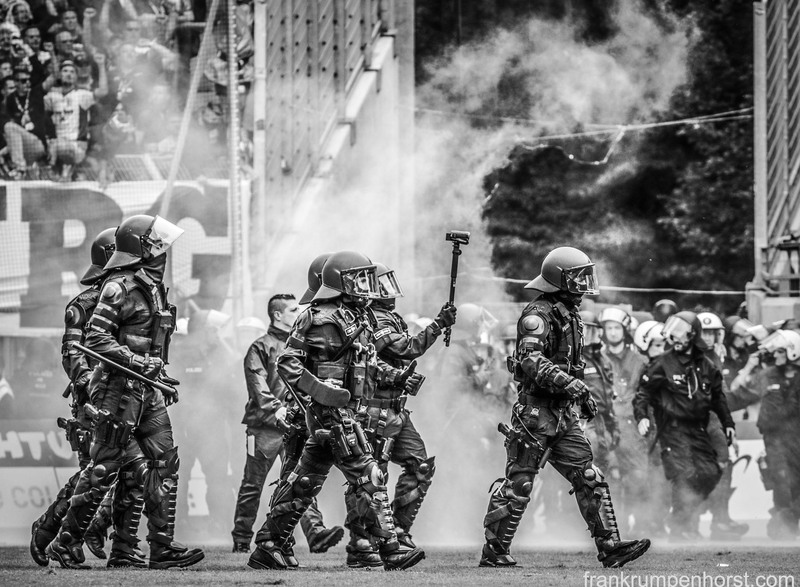 This entry was posted in fußball, germany, Photo, Photography, soccer and tagged 1. fc magdeburg, b-w, black and white, hooligans, kickers offenbach, ninja turtles, police, randale, riot, riot gear. Bookmark the permalink.